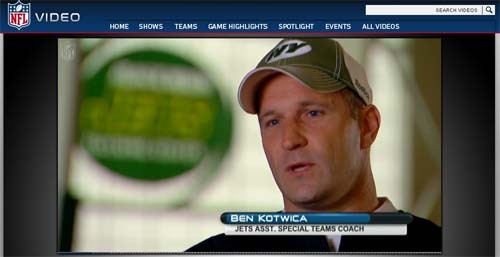 NFL.com has a great video on New York Jets assistant coach Ben Kotwica, a former Apache pilot in the 1st Cavalry Division. Kotwica, in his third year with the team, serves as an assistant special teams coach with the Jets. His background as a soldier who served in the Iraq War makes him quite unique among NFL coaches, and that’s what the video is all about. Kowtica is a 1997 West Point graduate, where he was a standout linebacker. He was a team captain his senior season in 1996 when Army set a program record for wins in a season (10) and played Auburn in the Independence Bowl. Prior to getting hired by the Jets, Kotwica spent two seasons as defensive coordinator at the USMA Preparatory School. Watch the four-minute video here.